Muralitharan’s feat, apart from being a BIG moment for cricket, is also testimony to the thrill and supremacy that only Tests command. So much for the death of Test cricket. Muttiah Muralitharan, one of the game’s modern titans, played his final remarkable hand yesterday, taking Sri Lanka towards victory over India. At Headingley, meanwhile, Australia battled to stay in a tight contest against Pakistan, having been bowled out for 88 in their first innings on Wednesday. Imran Khan, the great Pakistan all-rounder, was the latest to foresee Test cricket's demise this week, warning that the financial lure of Twenty20 will lead to more and more players choosing to avoid the five-day game. Paying glowing tributes to Muttiah Muralitharan, who had just retired from Test cricket, former India captain Sourav Ganguly today said he would rate the Sri Lankan a tougher spinner to face than his long-time competitor Australian Shane Warne. India may have flopped in the opening cricket Test against Sri Lanka but opener Virender Sehwag held on to the number one spot, while Sachin Tendulkar gained a place to be seventh in the latest ICC rankings for batsmen issued today. Steven Smith's scored a maiden half-century as his late assault on the Pakistan bowling helped Australia set a competitive target of 180 for Pakistan to win the second test at Headingley on Friday. Delhi registered their second consecutive win with a 2-0 victory of Uttar Pradesh to inch closer to pre-quarterfinals of the 64th National Football Championship for Santosh Trophy at Khardah Stadium here today. Delhi now lead Cluster V with six points from two matches and require a draw against Madhya Pradesh on July 25 to seal a last 16 berth. The five-member inquiry panel appointed by Hockey India to probe into the sexual misconduct allegation levelled against women's hockey team chief coach Maharaj Kishan Kaushik by woman player Ch. Ranjitha Devi, today submitted its report, which is learnt to be a "factual account" of the episode after the panel examined the written submission of both the parties and their oral statements. Even Rs 400 crore has not proved enough for the authorities to import underwater electronic equipments for the Shayma Prasad Mukherjee (SPM) swimming complex, which will hold swimming events during the Commonwealth Games (CWG). Just five days ahead of the Hockey India’s (HI) scheduled elections at New Delhi, the Hockey Chandigarh today knocked the doors of Punjab and Haryana High Court to get affiliation from the government-backed body. Beijing Olympics quarter-finalist Jitender Kumar and former women's world champion Lekha KC are among the three pugilists recommended by the Indian Boxing Federation (IBF) for this year's Arjuna awards. N Usha is the third boxer recommended by the IBF for the awards, which would be given away on August 29 - the National Sports Day. Grandmaster Parimarjan Negi finally broke his point duck with a morale-boosting draw with leader Wesley So of Philippines in the fourth round of the Young Grandmasters tournament, a part of the 43rd Biel chess festival here. So much for the death of Test cricket. 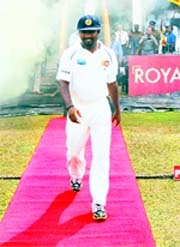 Muttiah Muralitharan, one of the game’s modern titans, played his final remarkable hand yesterday, taking Sri Lanka towards victory over India. At Headingley, meanwhile, Australia battled to stay in a tight contest against Pakistan, having been bowled out for 88 in their first innings on Wednesday. Imran Khan, the great Pakistan all-rounder, was the latest to foresee Test cricket's demise this week, warning that the financial lure of Twenty20 will lead to more and more players choosing to avoid the five-day game. There has never been a Twenty20 game, though, that could offer the sort of drama that Murali created with his last-ever ball in Test cricket, when he induced an edge from the Indian tail-ender Pragyan Ojha which was taken expertly by Mahela Jayawardene at slip. Murali has rarely been off centre stage during a career that has embraced glory and controversy but this was a special way to go even by his standards. “I don't want to get into comparison but I would prefer Warne. Murali is more accurate and has more variations so tougher to face,” Ganguly said. Ganguly termed Muralitharan's Test retirement after his final five-day game against India at Galle as end of an era. “Warne, Kumble had already retired and now Muralitharan... 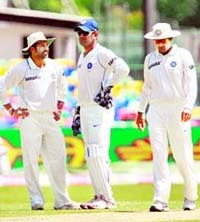 It is an end of an era,” Ganguly said. “Murali's record will be very hard to beat, he has been a great chapter in Sri Lankan cricket, having reigned supreme for more than 15 years. He is hard to be compared with anybody,” he added. Sehwag, who scored 109 and 31 in the Test which India lost by 10 wickets, has opened up a 14-point gap over second-placed Kumar Sangakkara. Meanwhile, Sri Lanka's iconic off-spinner Muttiah Muralitharan, who spent a record 214 Tests and 1,711 days in the number-one spot, retired from Test cricket at the third spot in the bowling chart. The 38-year-old, who finished with 800 wickets from 133 Tests, bowed out in third position behind Dale Steyn of South Africa and Pakistan's Mohammad Asif after climbing two spots in the latest rankings following figures of 5-63 and 3-128 which set-up a 10-wicket victory for Sri Lanka in the first Test of the three-match series in Galle. The bowlers dropping in the latest rankings include off-colour Indian pacer Ishant Sharma, who was down one spot to 22nd, Rangana Herath (31st, down six places) and Pragyan Ojha (58th, down by nine places). Steven Smith's scored a maiden half-century as his late assault on the Pakistan bowling helped Australia set a competitive target of 180 for Pakistan to win the second test at Headingley on Friday. Australia were bowled out for 349 on the stroke of tea on the third day as number eight batter Smith butchered 77 in 100 balls. He began slowly but eventually smashed nine fours and two sixes, including two in succession off leg-spinner Danish Kaneria with the latter finding the roof of the rugby ground stand. Smith was the last man out, bowled by Umar Gul. Australia lost key wickets throughout the day in pleasant batting conditions but managed to eke out enough runs to set up what is likely to be a nervous chase for Pakistan, who have not beaten Australia in a test for 15 years and must win to draw this two-match series. Australia's battling effort, after they were dismissed for a 26-year low 88 in the first innings, has given genuine hope of an eighth straight test win. Mohammad Aamer, the 18-year-old left-arm pace bowler, claimed all three wickets of the morning session and he finished with four for 86 as Australia's last five wickets raised 185 valuable runs. Bowling: Aamer 27-6-86-4, Asif 26-4-83-2, Gul 15.3-1-80-1, Amin 6-1-12-1, Kaneria 21-2-74-2. In another match of the same cluster, Madhya Pradesh defeated Arunachal Pradesh 3-1 at Howrah Stadium to score their first win. In a Cluster VI match, Chhattisgarh rode on a Wasim Raza strike in the 31st minute to beat Sikkim at Mohun Bagan ground here. Both Delhi and UP had wins against their respective opponents in their first matches and they began on a watchful note and the first half remained goalless. Tuishim Mashangva gave Delhi the lead in the 60th minute while Bhuvan Joshi converted a penalty in the 78th minute to shatter UP's hopes. The Hockey India panel, headed by Rajiv Mehta, and comprising Ajit Pal Singh, Zafar Iqbal, Dr Sudarshan Pathak and Anupam Gulati, has not apparently made any inference from their inquiry, but given only a factual account of what had transpired in front of them. Rajiv Mehta said the inquiry panel based its report from the testimonies of the coach and the player/players, and not on any other evidence. “We had lots of testimonies from both the parties, some players and manager Madhu Yadav, and we didn't need any other evidence before concluding our report”, Rajiv Mehta added. Hockey India will submit the report to the Sports Authority of India (SAI) tomorrow for further action, as coach Kaushik and video grapher Basvaraj were engaged by it. Hockey India secretary-general Narinder Batra said in the afternoon that the body had received the panel report “which we will study and discuss thoroughly before submitting the report to SAI”. But it was unlikely that Hockey India too may come to any definite conclusions based on the report. M.K.Kaushik resigned as chief coach following the sexual harassment charges against him, professing his innocence, and Hockey India president Vidya Stokes had accepted it. The videographer was sacked earlier when evidence surfaced about his compromising positions with prostitutes during the team's tour of Canda and China. Hockey India wants to get rid of the controversy without tying itsef in knotts ahead of the Hockey India elections on July 28, and it's playing its card clerverly, neither overtly supporting the coach, nor fully negating the stance of the girls. 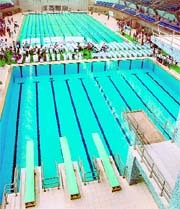 The officially inaugurated SPM swimming complex is all set to hold test events for the games from July 27 without underwater electronic machinery called “touch pad”. The Organising Committee (OC) has not been able to import the equipment so far. The stadium has been renovated at the whooping cost of Rs 400 crore and was inaugurated on 18 July. The equipment, which is fitted under the swimming pool, records the exact time of the reach of each swimmer and displays it on the board. “The results of the test events will be based on manual observation which would undoubtedly include errors,” he said. The absence of the equipment will deny Indian swimmers the advantage of knowing the exact status of their performance during tests. With only 72 days left, the CWG stadiums are getting inaugurated every second day. But what has left everybody wondering is the quality of the work delivered in the hustle-bustle of the run-up for the games. The authorities undertaking the completion of the CWG venues are now just smartening up things on the surface. The members also said the stadium would further require atleast more than one month to get complete. “There is no way that can complete the stadium before a month or two,” said sources. Not only this, the changing rooms in the complex have been reduced to half in both size and numbers. However, the Secretary of the Association, Raj Kumar, said the OC has managed to get the equipments from Pune on temporary basis but they are yet to be installed. “The touch pads used in the Youth Commonwealth Events in Pune have been brought here for the trial events but they are yet to be installed,” said Raj Kumar. The sources said it required around eight days to install and test the equipment but given only four, it is nowhere possible that it would be installed. He also confirmed that the main machinery to be used during the games had been not yet imported. The stadium was built before the ’82 Asiad. The local body, which was earlier named as the Chandigarh Hockey Association (affiliated with the Indian Hockey Federation), filed the case through its president Chander Shekhar, IPS and senior vice-president of the Indian Hockey Federation and Secretary General Yash Pal Vohra. Notably, the HI approved the affiliation of Hockey Chandigarh along with 11 other states without any issue during its November 30, 2009 meeting. The HI also called on two representatives (one male and one female) from the HC to attend their first annual general meeting scheduled for February 7, 2010. But later in the end of May, the local body was disaffiliated, asking them to send their application through the Chandigarh Olympic Association. But somehow the body could not get the required recommendation. Later the name of Chandigarh body was not found mentioned in the electoral college of the body. Along with the government, the Indian Olympic Association also backs the Hockey India. Seven other state units, including Tripura, Tamil Nadu, Mumbai, Andhra Pradesh and Rajasthan have also filed the cases to attend the July 28 elections. While Lekha clinched the middle weight gold in the 2006 edition of the World Championship held here, Usha has been a two-time silver medallist in the same event. “All three of them have performed well in the past three years and we thought they are the best contenders from boxing for the Arjuna Award,” Indian Boxing Federation Director AS Dagar said. Both Lekha and Usha had been recommended last year as well but Jitender 's name has been nominated for the first time. “It is a huge honour for me to be recommended for this award. I hope I get it,” said Jitender, a two-time Asian Championship bronze medallist, who created quite a flutter at the 2008 Beijing Olympics by fighting his quarterfinal bout with 10 stitches on his chin. The 22-year-old Harayana boxer was also a bronze medallist in the 2008 World Cup held just a few months after the Olympics. He was recently signed up by the World Series of Boxing's Indian Franchise Videocon for the professional-style tourney starting November 19.